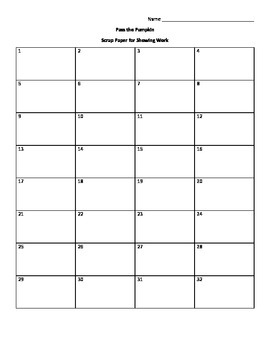 Looking for an activity to use on Halloween? This is a great one! 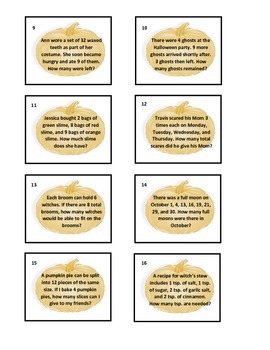 This activity provides 32 Halloween math story problems printed on pumpkins. Students will solve the problems and record their answers on the provided answer sheet. 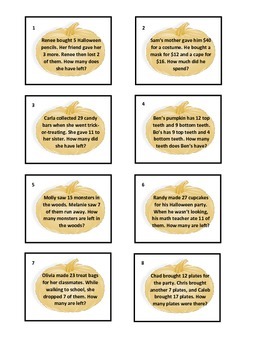 The fun part is passing the pumpkins around the room and solving the silly problems. 1. Renee bought 5 Halloween pencils. Her friend gave her 3 more. Renee then lost 2 of them. How many does she have left? 2. Each broom can hold 6 witches. If there are 8 total brooms, how many witches would be able to fit on the brooms? Full directions are included on the first page.